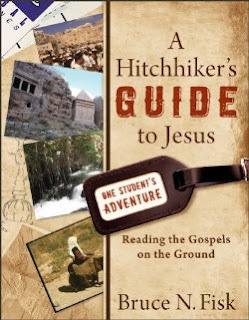 Last week the kind folks at Baker publishing sent me a copy of Bruce Fisk's new book A Hitchhiker's Guide to Jesus: Reading the Gospels on the Ground. Here is the blurb. Theissen's The Shadow of the Galilean, only better. Now here is the best part. I will be participating in a blog tour that will feature reviews of Fisk's book. In the first week of October Baker has arranged for bibliobloggers to post reviews of the book. And, there will also be contests with prizes. So be sure to check back in October for the blog tour. In the mean time, order Fisk's book. You will not regret it. Student's perspective: My mind is being stretched by so many new thoughts and ideas in this book that my brain feels like Silly Putty. It will be interesting to see how it all shakes out in the end after I finish. With that being said, I can't put it down either, as I am too curious as to what "Norm" discovers next. I have this horrid fascination of what belief I hold onto that will be dissected apart next. BTW, my cover is slightly different from yours. Instead of one picture at the bottom left, my copy has two.